I’m excited to announce that the Brain Injury Radio Network (BIRN) has signed me on to run a once-monthly call-in streaming radio show! This new streaming radio show will be focused on art. Whether it’s your personal expression, therapy, political statements, or pure fun, what does art bring to your life? What are you working on? What are your dreams? How can you–as the whole, complete person you are–reach for those dreams? What obstacles can we work together to break down? If someone says you’re voiceless, how can you use art to let them know you are not voiceless? You may have been silenced, but you have a voice. Think about how you can–and do–reach into your community and reach out to other communities. Paint, draw, film, photograph, sing, tell a story. Tell us about the art of living with your brain injury. Tell us about the art you make. We’re 5:00 — 6:45 pm the 1st Tuesday of the month. Follow the link above to listen online and dial 424-243-9540 to talk, ask questions, and share. 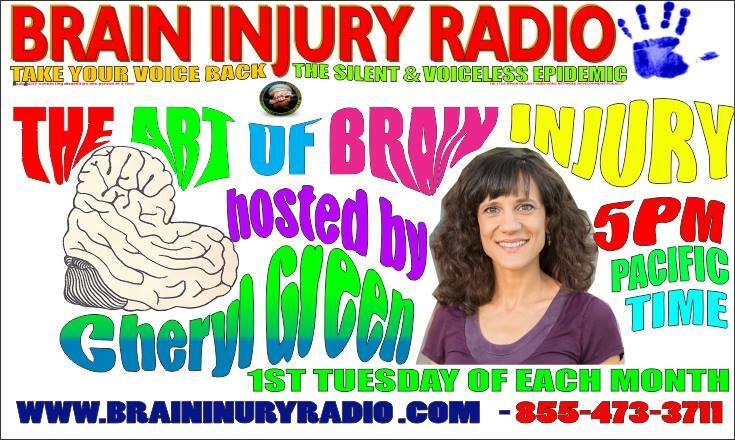 This entry was posted in Brain Injury News, Community Events and tagged "The Art of Brain Injury, Brain Injury Radio Network, brain injury streaming radio online, Cheryl Green by BIRRDsong. Bookmark the permalink.